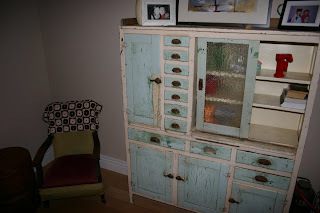 This gorgeous old cupboard was my Grannies. As a child I don't remember ever noticing it, it wasn't until I was an adult that I fell in love with it. I love everything about it, the colour, the cracked and peeling paint and the little drawers but mostly I love that it was Grannies. It is called "Grannie's cupboard" in our house. Not a day goes by that I don't stop to look at its worn beauty and think of my beautiful Granny that is no longer with us.